See below for screen shot with help callouts. The six color buttons (gray, white, black, red, green, blue) are quick colors. That gives you a way to start with a certain color. Whenever you click a quick color, the current color is saved in the wildcard quick color ( ). That way, you have a way to get back to the previous color. The wildcard quick color will not save one of the existing quick colors. How do I save my colors? The current version of the Color Picker does not save colors in a file. You can use the "Copy Color" function to get the color on the clipboard in a format that you can store in a separate file. When you start Color Picker, it will restore your current color and placeholder colors from the last time you exited the app. Choose "Options..." from the system menu ( ). That's what the placeholders are for. When you click the current color -- the big color control at the top -- the current placeholder will store that color. To change current placeholder, click one of the uninitialized placeholders ( ) to make it the current one. If all the placeholders are initialized, use Ctrl+Click to change the current placeholder. To restore the color from a placeholder color, just click that placeholder. You can also run several instances of the Color Picker. You can copy the color from your editor into the clipboard, then paste it into the Color Picker using the "Paste Color" button. Be sure to pick the correct color format first. If you paste a bitmap, Color Picker will choose the upper left pixel as the color. If your color is displayed, you can also use the Picker ( - click and hold) and select your color directly from the screen. When you use the Picker, press and hold a Ctrl key to magnify a portion of the screen around the mouse. Use the clipboard with the "Copy Color" button. Choose the format you want. If your preferred format is not listed, let me know. "Alpha" is a value used in transparency. The Color Picker will include the alpha value for AWT and .Net formats, if you choose. You can also use the Alpha feature to play with your color in other ways, even if you don't use .Net or AWT (see below). In the Alpha window, the Alpha value is rendered against the background you choose. In the main window, the Alpha value is rendered against a pure white background. RGB are three values -- Red, Green and Blue -- which make up your color. That gives you a total of 16,777,215 possible colors. Alpha is a transparency value. Even though it's a fourth value, it does not allow the description of any new colors. With an Alpha value less than 255, the rendered color will depend on the background. The specific technique for rendering a transparent color is called "Alpha Blending." How do I compare two colors? Use the Slider. First, edit the first color in the main window, then store it in your current placeholder by clicking the color. Then edit your second color. If you click "Slide...", the two colors will come up. You may have to choose one of the "Alternate" colors to find the one you want to compare with. How do I make a color darker or brighter? Using the Slide window, you can make your color darker or brighter. Choose a white alternate color, then slide the value until you see the brightness you like. Click OK. To make the color darker, follow the same steps, but use a black alternate color. Follow the same steps as when comparing two colors: Edit your first color and store it in your placeholder, then edit your second color. You may want to store your second color in a placeholder as well. Make sure your current placeholder is different from your current color by using Ctrl+Click to select the first placeholder. Choose "Slide..." and pick your first color as the background. Now changing the slider will give you a color between the two colors. When you see the color you like, click OK. The 'inside' color will become your new current color. To convert from hex to RGB, with your color on the clipboard, choose "HTML" from the Format combobox, then Paste Color. Choose the format you want to convert to, such as C++, then click Copy Color. To convert the other way, just follow the steps in reverse. Granite Tower Color Picker supports a number of predefined formats: HTML, Java, .Net, VB, etc. For all the predefined formats, you can specify or modify the prefix in the Options... dialog. You can also define a custom format. This format is based on a string with placeholders for the color values. It works a bit like sprintf() in C, but slightly different. 'a' or 'A': Use the alpha-value of the current color. 'r' or 'R': Use the red-value of the current color. 'g' or 'G': Use the green-value of the current color. 'b' or 'B': Use the blue-value of the current color. 'x': Switch to hex-output. 'a' through 'f' are printed in small-caps. 'X': Switch to hex-output. 'A' through 'F' are printed in large-caps. 'd' or 'D': Switch to decimal output. '0' (zero): Switch to octal output. The 'switches' are sticky, and it is possible to switch format multiple times in the same format string. How do I uninstall Color Picker? There is no install or uninstall for Color Picker. If you open the Options... dialog, you can use the "Clear Registry" button to delete all Color Picker related entries from the Windows registry (current user only). That's it! 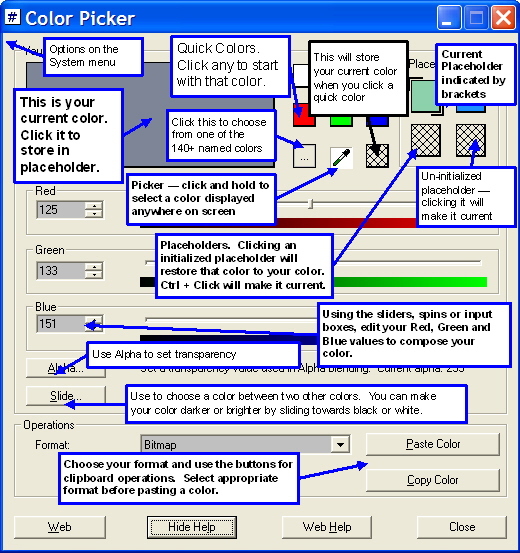 Color Picker doesn't change any other aspects of your system. If you want to do this, we would really like to understand why .